The Piri Reis Map, which is a genuine document, not a hoax of any kind, was made at Constantinople in 1513 CE. It focuses on the western coast of Africa, the eastern coast of South America, and the northern coast of Antarctica. Piri Reis could not have acquired his information on this latter region from contemporary explorers because Antarctica remained undiscovered until 1818 CE, more than 300 years after he drew the map. The ice-free coast of Queen Maud Land shown in the map is a colossal puzzle because the geological evidence confirms that the very latest date that it could have been surveyed and charted in an ice-free condition is 4000 BCE. It is not possible to pinpoint the earliest date that such a task could have been accomplished, but it seems that the Queen Maud Land littoral may have remained in a stable, unglaciated condition for at least 9,000 years before the spreading ice-cap swallowed it entirely. There is no civilization known to history that had the capacity or need to survey that coastline in the relevant period, i.e. between 13,000 BCE and 4000 BCE. In other words, the true enigma of this 1513 map is not so much its inclusion of a continent that was not discovered until 1818 but rather its portrayal of part of the coastline of that continent under ice-free conditions that came to an end 6,000 years ago and that have not since recurred. How can this be explained? Piri Reis obligingly gives us the answer in a series of notes written in his own hand on the map itself. Here he tells us that he was not responsible for the original surveying and cartography. On the contrary he honestly admits that his role was merely that of compiler and copyist and that his own map was derived from a large number of source maps. Some of these had been drawn by contemporary or near-contemporary explorers (including Christopher Columbus), who had by then reached South America and the Caribbean, but others were documents of great antiquity dating back to the fourth century BCE or earlier. originated with a people unknown and they were passed on, perhaps by the Minoans and the Phoenicians, who were, for a thousand years and more, the greatest sailors of the ancient world. We have evidence that they were collected and studied in the great library of Alexandria [Egypt] and that compilations of them were made by the geographers who worked there." "Most of these maps were of the Mediterranean and the Black Sea. But maps of other areas survived. These included maps of the Americas and maps of the Arctic and Antarctic Oceans. It becomes clear that the ancient voyagers traveled from pole to pole. Unbelievable as it may appear, the evidence nevertheless indicates that some ancient people explored Antarctica when its coasts were free of ice. It is clear, too, that they had an instrument of navigation for accurately determining longitudes that was far superior to anything possessed by the peoples of ancient, medieval or modern times until the second half of the 18th century. Despite a ringing endorsement from Albert Einstein, as we shall see below, and despite the later admission of John Wright, President of the American Geographical Society that Hapgood had "posed hypotheses that cry aloud for further testing" no further scientific research has ever been undertaken into these anomalous early maps. Moreover, far from being applauded for making a serious new contribution to the debate about the antiquity of human civilization, Hapgood himself continued until his death to be cold-shouldered by the majority of his professional peers -- who couched their discussion of his work in what has accurately been described as "thick and unwarranted sarcasm, selecting trivia and factors not subject to verification as the bases for condemnation, seeking in this way to avoid the basic issues." The late Charles Hapgood taught the history of science at Keene College, New Hampshire, USA. He wasn't a geologist, or an ancient historian. It is possible, however, that future generations will remember him as the man whose work undermined the foundations of world history - and a large chunk of world geology as well. "I frequently receive communications from people who wish to consult me concerning their unpublished ideas," Einstein observed. "It goes without saying that these ideas are very seldom possessed of scientific validity. The very first communication, however, that I received from Mr. Hapgood electrified me. His idea is original, of great simplicity, and - if it continues to prove itself -- of great importance to everything that is related to the history of the earth's surface." Antarctica was not always covered with ice and was, at one time, much warmer than it is today. It was warm because it was not physically located at the South Pole in that period. Instead it stood approximately 2,000 miles further to the north. This "would have put it outside the Antarctic Circle in a temperate or cold temperate climate." The continent moved to its present position inside the Antarctic Circle as a result of a mechanism known as earth-crust-displacement. This mechanism, in no sense to be confused with plate-tectonics or so-called continental drift, is one whereby the lithosphere, the whole outer crust of the earth: "may be displaced at times, moving over the soft inner body, much as the skin of an orange, if it were loose, might shift over the inner part of the orange all in one piece." "During the envisaged southwards movement of Antarctica brought about by earth-crust displacement, the continent would gradually have grown colder, an ice-cap forming and remorselessly expanding over several thousands of years until it at last attained its present dimensions." Orthodox geologists, however, remain reluctant to accept Hapgood's theory (although none have succeeded in proving it incorrect). It raises many questions. Of these by far the most important is the following: what conceivable mechanism would be able to exert sufficient thrust on the lithosphere to precipitate a phenomenon of such magnitude as a crustal displacement? The Piri Reis Map seems to contain surprising collateral evidence in support of the thesis of a geologically recent glaciation of parts of Antarctica following a sudden southwards displacement of the earth's crust. Moreover since such a map could only have been drawn prior to 4000 BCE, its implications for the history of human civilization are staggering. Prior to 4000 BCE there are supposed to have been no civilizations at all. Civilization first developed in the "Fertile Crescent" of the Middle East. This development only began after 4000 BCE, and culminated in the emergence of the earliest true civilizations (Sumer and Egypt) only at around 3000 BCE, soon followed by the Indus Valley and China. About 1,500 years later, civilization took off spontaneously and independently in the Americas. Since 3000 BCE in the Old World (and about 1500 BCE in the New) civilization has steadily "evolved" in the direction of ever more refined, complex and productive forms. In consequence, and particularly by comparison with ourselves, all ancient civilizations, and all their works, are to be understood as essentially primitive (the Sumerian astronomers regarded the heavens with unscientific awe, and even the Pyramids of Egypt were built by "technological primitives"). The evidence of the Piri Reis map appears to upset all this. In his day, Piri Reis was a well-known figure, and his historical identity is firmly established. An Admiral in the Navy of the Ottoman Turks, he was involved, often on the winning side, in numerous sea battles of the mid-16th century. He was, in addition, considered to be a great expert on the lands of the Mediterranean, and was the author of a famous sailing book, known as the Kitabi Bahriye, which provided a comprehensive description of the coasts, harbors, currents, shallows, landing places, bays and straits of the Aegean and Mediterranean Seas. Despite this illustrious career he somehow managed to fall foul of his masters and was eventually beheaded in 1554 or 1555. The source maps that Piri Reis used to draw up his 1513 map were, in all probability, originally lodged in the Imperial Library at Constantinople, to which the Admiral is known to have enjoyed privileged access. Those sources (which may in turn have been transferred or copied from other even more ancient centers of learning) no longer exist, or, at any rate, have not yet been found. It was, however, in the library of the old Imperial Palace at Constantinople that the Piri Reis map was itself rediscovered, painted on a gazelle skin and rolled up on a dusty shelf, as recently as 1929. As the baffled Lt. Colonel Ohlmeyer admitted in his letter to Hapgood in 1960, the Piri Reis map depicts the subglacial topography, the true profile of Queen Maud Land Antarctica beneath the ice. This profile remained completely hidden from view from 4000 BCE (when the advancing ice-sheet covered it) until it was at last revealed again as a result of the comprehensive seismic survey of Queen Maud Land that was carried out during 1949 by a joint British-Swedish scientific reconnaissance team. If Piri Reis had been the only cartographer to have had access to such anomalous information then it would be wrong to place any great weight on his map. At the most one might say "Perhaps it is significant but, then again, perhaps it is just a coincidence." The Turkish Admiral, however, was by no means alone in the possession of seemingly impossible and inexplicable geographical knowledge. It would be futile to speculate further than Hapgood himself has already done as to what manner of "underground stream" could have carried and preserved such knowledge through the ages, transmitting fragments of it from culture to culture and from epoch to epoch. Whatever the mechanism, the plain fact is that a number of other cartographers do seem to have been privy to the same curious secrets. Is it possible that all these mapmakers could have partaken, perhaps unknowingly, in the bountiful scientific legacy of a vanished civilization? 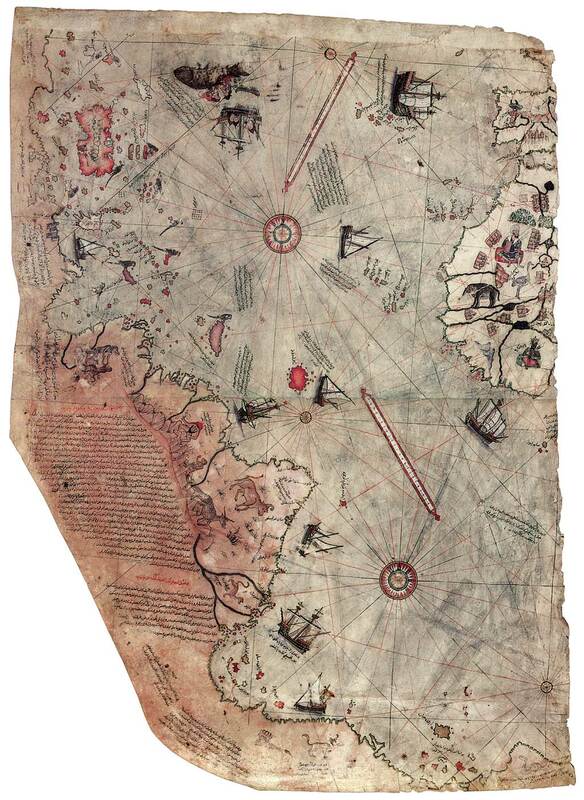 The Piri Reis map contains more mysteries than just Antarctica. Drawn in 1513, the map demonstrates an uncanny knowledge of South America -- and not only of its eastern coast but of the Andes Mountains on the western side of the continent, which were of course unknown at the time. The map correctly shows the Amazon River rising in these unexplored mountains and thence flowing eastward. Itself compiled from more than twenty different source documents of varying antiquity, the Piri Reis Map depicts the Amazon not once but twice (most probably as a result of the unintentional overlapping of two of the source documents used by the Turkish admiral. In the first of these the Amazon’s course is shown down to its Para River mouth, but the important island of Marajo does not appear. According to Hapgood, this suggests that the relevant source map must have dated from a time, perhaps as much as 15,000 years ago, when the Para River was the main or only mouth of the Amazon and when Marajo Island was part of the mainland on the northern side of the river. The second depiction of the Amazon, on the other hand, DOES show Marajo (in fantastically accurate detail) despite the fact that this island was not discovered until 1543. Again, the possibility is raised of an unknown civilization which undertook continuous surveying and mapping operations of the changing face of the earth over a period of many thousands of years, with Piri Reis making use of earlier and later source maps left behind by this civilization. Although they remained undiscovered until 1592, the Falkland Islands appear on the 1513 map at their correct latitude. The library of ancient sources incorporated in the Piri Reis Map many also account for the fact that it convincingly portrays a large island in the Atlantic Ocean to the east of the South American coast where no such island now exists. Is it pure coincidence that this "imaginary" island turns out to be located right over the sub-oceanic Mid-Atlantic Ridge just north of the equator and 700 miles east of the coast of Brazil, where the tine Rocks of Sts. Peter and Paul now jut above the waves? Or was the relevant source map drawn deep in the last Ice Age, when sea levels were far lower than they are today and a large island could indeed have been exposed at this spot? Thank you for posting interesting topics like this one. Michael Cremo's "Forbidden Archeology", offers good arguments and evidence that previous civilizations have come and gone for millions of years. Sort of like the direction our civilization appears to be headed. Why surrender to the PC Police and use the "CE" label to indicate date? Mr. Smith Goes To Washington.. The Santa Maria - PWNED! Hot Pick Of The Late Night - Cameltoe!